At Woodlawn Hunting Club, our clubhouse is approximately 1800 square feet with an upstairs "bunkroom" and a multi-purpose den/dining room downstairs. The clubhouse includes a full kitchen, washer and dryer, full bathroom with shower, cable TV, air conditioning, and a nice wrap around porch to enjoy the breeze and socialize. There is a cleaning shed next to the clubhouse equipped with lights, running water, stainless steel sink and table, concrete floors and electric winches. We also have a walk-in cooler which is convenient to store your meat. In addition we have two large gas grills which are nice when you are cooking for a crowd. 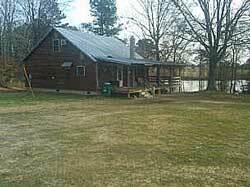 Woodlawn hunting club is located in the south-western corner of Halifax County, NC. About one hour northeast of Raleigh and 25 minutes north of Rocky Mount, it is located on the dividing line between the Coastal Plain and the Piedmont. This area provides a wide choice of terrain to enjoy.